Beer & Brewer has released its list of top 50 brewpubs in Australia and we’re proud to say we have come down from #7 to come in at number 4! 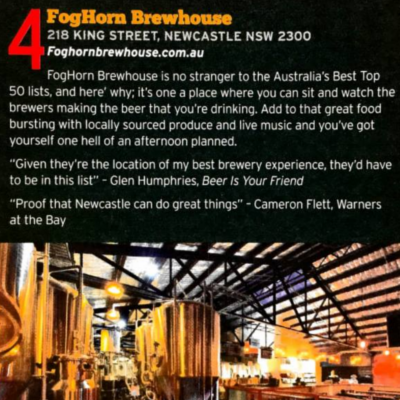 That makes us the #1 regional brewpub in Australia! The list was compiled with the help of 25 industry experts, including the likes of Ian Kingham, Matt Kirkegaard, Kirrily Waldhorn and Tim Charody, aka The Beer Pilgrim. Each expert voted for their five favourite brewpubs, with the scoring weighted so those at the top of the panelists’ lists scored higher than those at the bottom. There were no strict criteria, judges voted based on a range of factors such as the quality of beers, service, staff knowledge, and venue atmosphere. Congratulations to our mates down the road at the Grain Store who were named #1 venue in regional Australia.